The Studio for Interactive Media worked with Brand New School; Goodby, Silverstein & Partners; and Obscura Digital to create this reactive mural which debuted at the Adobe Creative Suite 3 launch event. The mural was later installed in the storefront of the Virgin Megastore in Union Square, NYC. 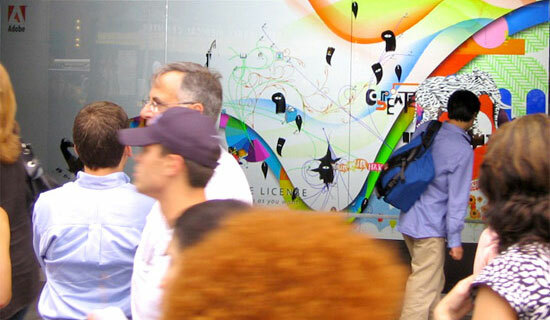 This mural uses a video camera to watch as people walk by and reacts to their movement by revealing a mixed-media mural.